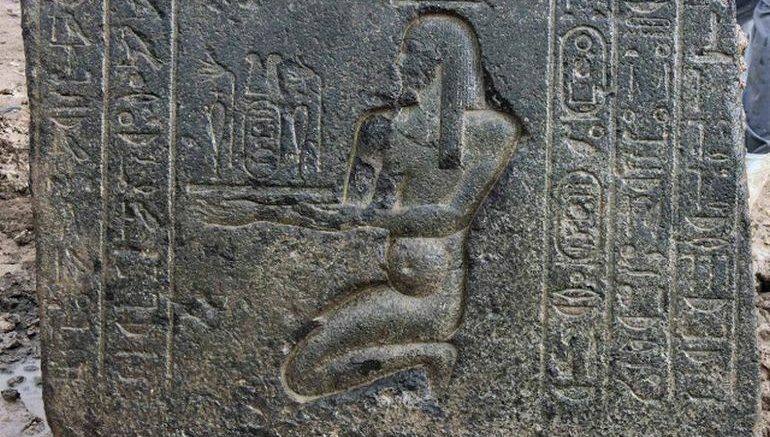 Wall releif of Hapi - goddess of Nile. Kheperkare Nakhtnebef, also known by his hellenized name Nectanebo (380-363 BC), was the founder of the last native Ancient Egyptian dynasty (30th Dynasty) before the realm was overrun by Alexander the Great (and then controlled by the Ptolemies). 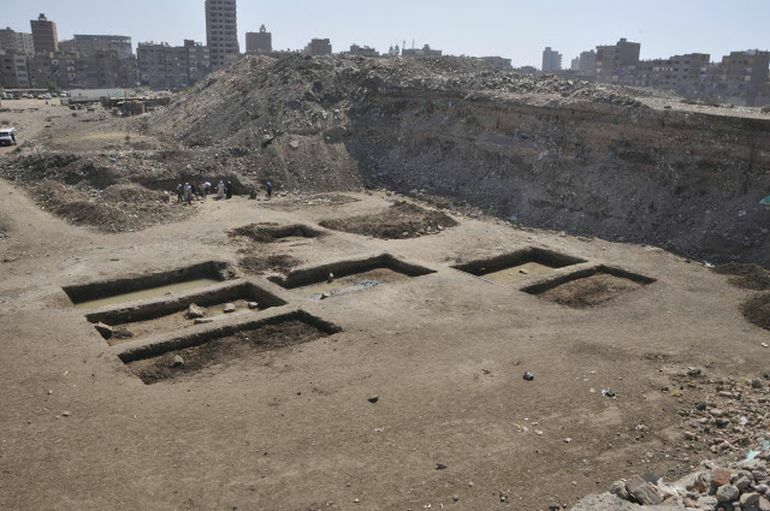 And now a joint Egyptian-German Archaeological Mission has been able to excavate parts of Nectanebo’s sanctuary, inside the confines of Heliopolis, presently in the suburb of Ayn Shams, on the north-eastern side of Cairo. The excavation site in Cairo. 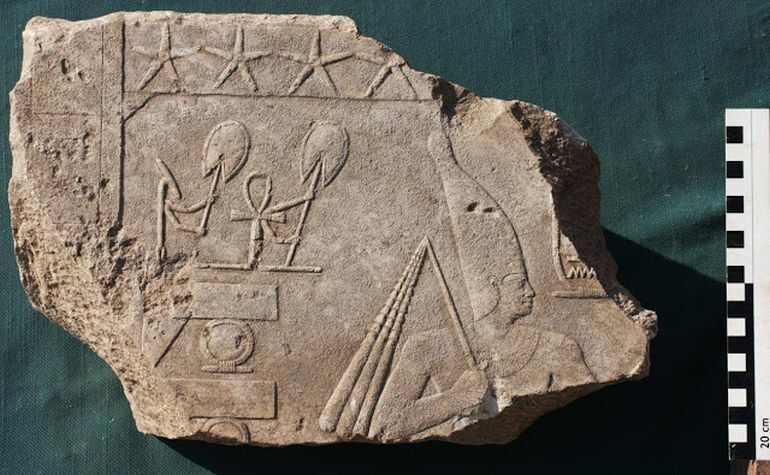 The Egyptian – German Mission working in Heliopolis Temple uncovered the bottom part of a chapel that belongs to King Nectanebo I of the 30th Dynasty. The uncovered piece consists of carved Basalt blocks in addition to a part of a royal statue carrying a cartouche of King Merineptah…Declared Dr. Eldamaty Minister of Antiquities. It is the first time that a chapel is found within the borders of this temple, clarified Eldamaty noting that ground water is being reduced now in order to complete excavation works inside this huge and extremely important temple. On the other hand, Dr. Aiman Ashmawy, head of the Egyptian Mission from the Ministry of Antiquities added that the uncovered part of the statue depicts King Merineptah [son of Ramses II] of the 19th Dynasty presenting an offering to a deity, pointing out that excavation works performed at the area revealed layers of human settlements; pottery and other evidences dating to Pre and Early Dynastic Periods. Dr. Detrich Rau, Head of the German Mission finally added that the rest of the chapel is expected to be uncovered during the next season noting that the temple’s mud brick walls were found with width of 15m. and that he hopes new objects to be found in the near future. 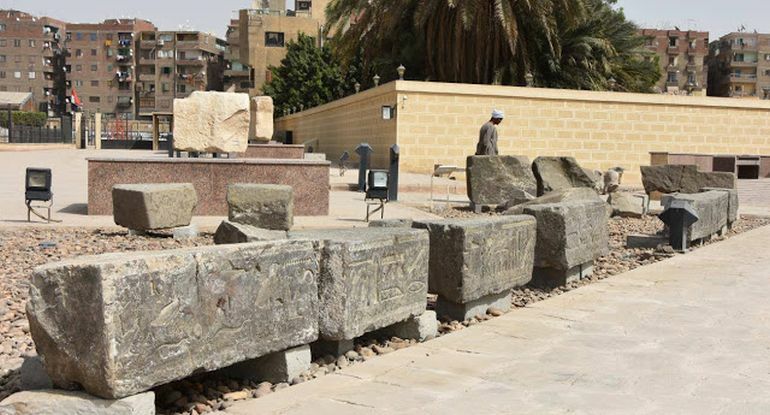 Pertaining to the finds from the earlier period, the archaeologists have also come across evidences of massive stone blocks and huge sculptural works that hint at the remains of an imposing temple of the famous Egyptian Pharaoh Ramses II. The location of this precinct is somewhere between the Suq el-Khamis temple site of Ramses II and the aforementioned Nektanebo temple. In addition, the researchers had previously also identified ‘later’ dated architectural specimens from the Greek-origin Ptolemaic dynasty of Egypt. Engraved stone blocks salvaged from the site. Reliefs discovered by the mission.